This began life as an article I wrote for Multiverse #3, in 1980,entitled "Ninja in the Belfry", which was then revised and updated when a penpal in Japan sent me an LP of the music and some of the dialogue from he Samurai which also had a lot of background information from one of the producers. This became an 80 page booklet I published in 1988, entitled The Samurai. When I got a computer in 1998, I scanned the booklet and put it on my website. Obviously, since I was relying on old memories, the booklet (on which this is based) was rather incomplete, particularly in story synopses. Now that all the stories have been released on DVD, I have been able to rectify that. Over the years I have added to the website as I have found out more information or corrected things so it is in many ways quite different to the original booklet. I have also been able to compile a sort of encyclopaedia of people places and things (along the lines of the Star Trek Concordance, something I've always wanted to do). All of them were known for innovative use of the camera and/or special effects. Dark Shadows used CSO (or Chromakey as the BBC called it) as far back as 1967, a good ten years before Dr. Who but Dr. Who made some ingenious uses of the current technology in 1963 to create screens that showed different things on them in the first Dalek story. Later on in the decade the makers of 2001: A Space Odyssey visited the Dr. Who studios to see how they handled the depiction of weightlessness (they were making "The Moonbase" ). The Samurai was well known for its bold and distinctive camera angles and movements, as well all of the bits of business involving ninja weapons and tricks. Of course, all three had their effects that didn't work so well (Dark Shadows' notorious bats on a string, The Samurai's "drip-dry ninja", Dr. Who's sometimes dodgy Chromakey , to name a few). All three had a slow start until the introduction of a feature with which their names became synonymous. With Dr. Who it was the Daleks in the second story; and, of course, with The Samurai it was the ninja, also introduced in the second story and with Dark Shadows it was vampires (in the form of Barnabas Collins) introduced in the show's second year. All three borrowed, often heavily from older sources. Dr. Who used Greek myth, either directly or indirectly, Gothic literature, Sherlock Holmes, to name a few. Both Dark Shadows and The Samurai shamelessly ransacked their respective genres: Gothic literature and films on the one hand, and samurai and ninja films and novels on the other, often incorporating ideas at the last minute. Shooting for all three was done quickly, though at least The Samurai and Dr. Who could afford retakes most of the time and spared us the notorious microphone-boom shadows of the American soap. And all three often boasted beautiful costumes, despite their budgets (one thinks of Dr. Who's "Marco Polo" story and many of the other historicals, including "Masque of Mandragora", Dark Shadows’ many flashbacks, especially to 1795 and 1840 and the costumes of the officials, the boy shogun and even the attractive summer clothing Shintarō and his friends wore in The Samurai). Finally, all three had two feature film spin-offs produced during their run. 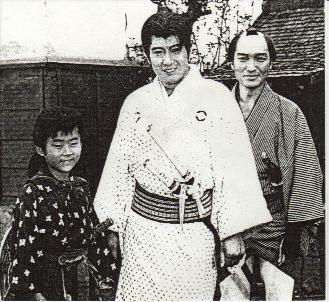 Two of them had plays derived from them during their run which featured their chief nemesis - Dr. Who had Curse of the Daleks in 1965 and The Samurai's 1965 play featured ninja heavily. Even Dark Shadows had a play done, featuring Barnabas, but not until decades later. Before Blake's 7, before Star Wars, before The Man From Uncle and even before Dr.Who there was another media phenomenon in this country - The Samurai. Though remembered by few people under 45 now, it had the same impact on the pre-teen set here at the time as Dr. Who had in Britain - if you read 'ninja' for 'Dalek'. I know, for I lived through both phenomena in both countries. The school playgrounds and streets saw hundreds of children turning handsprings, hurling cardboard 'starknives' (shuriken) and waving imaginary swords as they played 'samurai and ninja'. It was the most popular programme in TCN-9's (a Sydney commercial TV channel) history up to that time, its popularity surpassing even that of The Mouseketeers, which bore the palm to that time. So popular was it that an entrepreneur brought out the star from Japan to appear in a specially written 90 minute stage play based on the series in Sydney and Melbourne, a presentation which played to capacity houses in both cities. Just why it was so popular in Australia was something that baffled not only the TV programmers and the press but also educators, parents and even the Japanese star and production company. This has never been properly explained and probably never can be. It was one of those 'sports', a combination of the right elements at the right time which gives rise to such successes as Blake's 7, Star Trek, Star Wars or Dr.Who. Reams can be written without arriving at a satisfactory answer. Let us go back in time to its first run. It is early 1965,late summer, around January-February. Sir Robert Menzies is still Prime Minister as we are in the tail end of the 'Menzies era' with all that stood for in terms of conservatism; Australia is still 'the lucky country'; Australian troops are not yet committed to the war in Vietnam; decimal currency will not be introduced for another 12 months so we are still using £.s.d. ; Australia is still very much oriented towards Britain and the Commonwealth of Nations as Britain has not yet joined the EEC; TV is in black and white and only 9 years old. Then, as now, most programmes are either British or American with a handful of locally made ones (SBS is not even a glimmer in someone's eye). Among the British ones, Dr. Who has just started its run on the ABC. For the rest, they are the usual collection of dramas, police shows, war series, westerns, doctor shows and old films. Amongst the local products are current affairs programmes, quizzes, variety shows, the occasional drama or play and the popular and controversial satirical revue, The Mavis Bramston Show. In addition ,there were two solitary Japanese TV series ,one a cartoon, Astroboy (Tetsuwan no Atomu) and the other, The Samurai (Onmitsu kenshi). Why or how they came to be there represented a gamble, an experiment on the part of the TV channels concerned as the Japanese population of Sydney (indeed Australia) was minimal and the interest in Japan seemed likewise at the time. To my brother and myself (aged 10 and 13 respectively) who had but newly arrived in Sydney from London and who had been informed by schoolmates that The Samurai was, in the idiom of the time, 'massive' viewing, watching this series set in feudal Japan was a total revelation and a whole new experience, like so many other things in Australia. Prior to that we thought of Japan (if we thought of it at all) as "the place where the transistors come from." Now we were shown something of its history, its customs, its traditions, its martial arts and its scenery. In an immediate and vital way we came to care about some of its admittedly fictitious citizens and what had hitherto been a mark on the atlas came to life for us, became a reality. How many other children of a similar age group also came to have some glimmerings of an understanding or interest in Japan and its culture as a result of this early exposure to The Samurai is anyone's guess. It served to make a whole generation aware of one of our near neighbours in a way no amount of documentaries could by capturing the imagination and telling a very basic story of right and wrong and derring-do in a different, even exotic background. In my own case, it had an impact on my life as no other TV program - not even Star Trek or Dr. Who - has had, for it shaped my academic studies and my career. Because of that early and fascinating exposure to Japan, I majored in the Japanese language and Asian Civilization at the Australian National University, gaining a degree in Asian which led to my becoming a Japanese-language librarian in charge of one of the largest collections of Japanese books outside Japan and the United States. Interestingly, since the 1970s, Japanese studies in this country have increased dramatically. Australia has the largest number of people studying Japanese per capita in the world (outside of Japan, of course! ), which is something which a number of Japanese writers and journalists have commented and written about, analysed and discussed in sundry articles and books. After a decline in the mid 80s, there is once more a boom, called a 'tsunami' where enrolments in Japanese language courses at universities have gone up by 130%. The intense interest in Japan and the close ties between the two countries has more to do with economics (Japan being one of Australia's main trading partners) and any connection with The Samurai-craze of the 60s is probably tenuous, except in cases like my own, but it is interesting to speculate on the basis that might have been laid on this generation of Australians by that program. It certainly did inspire a great many to take up martial arts as the press reported at the time. TV critics and those people who wrote in the TV guides to praise it commented on the beauty of the photography and the settings, the heroic qualities of the main characters, their good looks and appeal, the swordsmanship and acrobatics displayed and the way it portrayed another culture and history, so different from what was usually seen on TV, such as westerns and war films. Children, particularly, were attracted to the acrobatics and many would try to emulate these by leaping and prancing about, trying to be ninja. Some made shuriken out of cardboard or jam tin lids to hurl about. The show had its critics, however. The most notable was the headmaster of a Sydney boys' prep school, Mr R.H. Morgan. He called it sadistic, cruel and violent, a view some others shared because of the swordplay and the Japanese penchant for graphic scenes of dripping blood and lopped-off limbs, though such scenes in the series were nowhere near as detailed or as common as in their movies. Mr. Morgan's comments sparked off a storm of controversy in the letter columns of the press. Other people complained that it lacked realism - the hero was just too good with his sword, the ninja did the impossible, etc. Yet others said it was silly and badly acted the result of the dubbing which was woeful. However, for every critic in print there were three or four to defend it, also in print. Looking back now over these letters preserved in my scrapbook for the past 40 years, one cannot help but be struck by the incredible narrow-mindedness and intolerance bordering on racism of some of the critics. As a rule, though, the only criticism most letter-writers had was that it was shown too early in the afternoon for most of them to see it. It was the first Japanese TV series to be shown in Australia and so had the impact of novelty to recommend it. Plans to screen others apart from The Phantom Agents (Ninja Butai Gekkō), The New Samurai (Shin onmitsu kenshi) and a number of cartoons never eventuated for reasons best known to the TV networks here. The demand was certainly there as letters in the press asking for more would indicate. We had to wait until 1981 and Monkey (Saiyūki), NET's version of the old Chinese classic, which caused every bit as much controversy as The Samurai, again chiefly because of violence and apparent incomprehensibility. It, too, had its staunch fans. In the late 1980s and early 1990s SBS screened a couple of Japanese TV dramas, Oshin and Rin (Hanare konma), these were more historical soap-operas and a far cry from the action and intrigue of The Samurai, though their one excursion into showing an NHK Taiga Drama, Takeda Shingen came a bit closer. Sadly they have never shown any others. A kimono-clad figure with two swords thrust through his obi is walking, back to the camera, towards the stone walled base of a Japanese castle. Suddenly a group of black clad, black-hooded figures spring from cover, swords drawn, only their eyes visible. The swordsman turns to them, raising the basket-like hat covering his head to reveal his face. The black-clad ones fall back. "Who are you?" one demanded. "A samurai," the other replies. "A samurai?" they echo as the title, 'The Samurai', written as if in brush and ink, appears over the tableau, accompanied by the theme music played on traditional instruments. And so another episode from the second season begins, leaving a whole generation of Australian children to wonder what the hell was so fascinating about being a samurai. Or from the opening of the second story, Koga Ninjas. Two tall Japanese-style candles burn, some distance apart in the darkness. On the tatami mat between them is a partly unrolled scroll covered with Japanese ideographs. A deep voice intones, "Three hundred years ago, in Japan, there were two societies who called themselves--ninja. One was Iga, the other Koga. They were professional spies and assassins, experts in acrobatics, swordsmanship, judo, karate and hypnotism. The secret scroll of the ninja had three rules: To train your body to endure any hardship; to forget all of your friends and family and keep your real identity secret; to accept death rather than divulge any of the secrets of the society of ninja." As he spoke, items of ninja equipment were tossed by an unseen hand into the area lit by the candles. There was a haunting sadness and eeriness to the various theme and incidental music which were often played on traditional instruments, particularly the drum and flute, or mixed with a modern orchestra, thus imparting a strange beauty seldom encountered in TV themes. In 1979 a LP featuring the theme music, songs and incidental music together with excerpts of spoken dialogue from selected episodes was released in Japan by King Records. An EP of the theme song was released at the time of the series' run in Japan in the 60s. Neither record was released in Australia.